I am jealous of Space Wolf players. I really am. They have some of the coolest looking models out there. They're definitely up there with Grey Knights and those new models just came out. Space Wolves are rich with background history, images and stories. 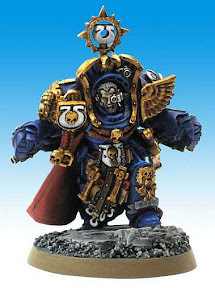 Still, there are some Space Wolf models out there that just don't represent how cool the character is in the Codex. And sometimes, you just want something different. 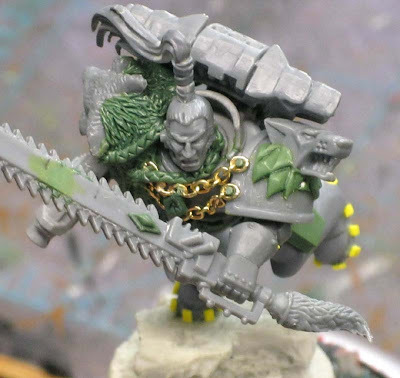 And it's not just Space Wolves either, there are lots of chapters (and armies for that matter) that have killer character models out there. Black Library gives us all kinds of background material to pull inspiration from as well. Tyranids.... I bet they have it tough. I don't know how much is out there about them. They don't really have named HQ models like the rest of us do. So how do you "get" a custom Independent Character? Good question. You've got a few options. 1. You can have someone build it for you. There are tons of folks out there who do commission work on all kinds of levels. From high end stuff to your basic "help a friend out" kind of thing. Let them know exactly what you're looking for, do your research and set a budget for your project. Finding the right person can take a little leg work, but can be well worth it in the end. The big hurdles here may be the timeline as most "good" artists are generally backed up and then there is the cost. This kind of thing can get expensive quick. One last thing to think of in this category is Shipping and Handling. If you can, try and find someone local or relatively close to you as it will keep the extra costs down and reduce the potential for problems with shipping things across the globe. If the person you want to build your model is on the other side of the world and you don't want anyone else to do it... just make sure you know how it's all going to work out in the end so you're not surprised. 2. Scratchbuild your own version. If you have the ability to build your character model from scratch (I wish I could do this), the sky is the limit here. Take your time and you can come up with something absolutely spectacular. A true original work. The big hurdle here is going to be the time it takes. 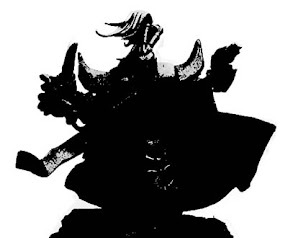 If you've got the skill, it's simply going to be a matter of setting aside the time to get this guy built. This may be the most rewarding method. To know that you built your own model from scratch can be very satisfying. But what if you can't scratchbuild an entire model? 3. Convert an existing model. I'm willing to bet this is where most of us fall. Scratchbuilding is tough, but most of us can swap out a head, an arm, a new torso and maybe do a little bit of greenstuff work to seal the deal. There are tons of bits out there to help those of us in this category. From the extras you might have left over in your bits box to online providers who have that one key piece you need to finish off your model. You shouldn't have any trouble getting a hold of what you need to convert your custom HQ. The hurdles here may not be as big as the other two options since you're saving both time and money by using bits. But... bits can get expensive if you're not careful. Try asking friends or trading for bits to help keep costs down in this category. Do I really need to convert my Character model? Is there anything wrong with using a regular, unaltered model? Of course not. Even a standard model that has a nice paint job can stand out among the masses. Nothing says you have to spend tons of money to have a unique model. If you like the look of the model as it is, then leave it that way. There are a handful of models I think look great just as they are and wouldn't change a thing to them. 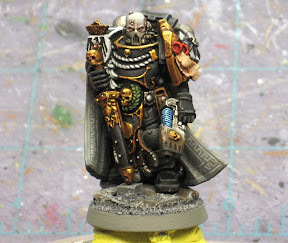 Taking the time to paint in the extra details or try your hand at some freehand will set your model apart despite it being the same thing that another player might be fielding. It comes down to putting your personal touch on your models. Maybe you focus on the model's base in this case and really try to make that into something of a work of art. Add that extra piece or try something different with it so your model stands out from the rest of your force. It doesn't have to be over the top, just enough to draw some attention. But what about Tyranid players, what can they do? I can honestly say that I would try looking through everything I could on animal color schemes. While your bugs may be the same as the next guy... a unique color scheme will speak volumes. 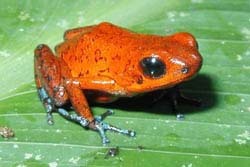 The poison tree frog there has an interesting look with his orange body and light blue-grey feet. The red spots are the icing on the cake. If you can find a color scheme you like AND can paint without creating an unbelievable amount of work for yourself, that's a win. I know that some armies can put down a few hundred models, so it's just as important that you look at how long it's going to take you to paint your killer color scheme. Having to do thirty plus steps to paint each of your 150 models may not make for much fun in the end. What does creating your own Character get you? Even changing something small or making a couple of minor adjustments, you really put your own personal touch on your army. Sure, your army was yours to begin with, but you want it to stand out. Whether you have someone else do it, start from scratch or modify an existing model, investing a little time into your character models will make your army look every bit as cool as their background would lead you to believe. Tyranids have got their share of named characters (although not all are HQs): The Swarmlord, The Parasite or Mortrex, Deathleaper, The Doom of Malantai, and Old One Eye (who's been around for a long time). While I do have many of the named character models painted up I never use them since I have also kitbashed my own versions of these models. For me there is nothing better than finishing and using a model that is product of my own imagination. Inspiration can be found in all sorts of places as well. I get alot of mine from leafing through the codex artwork. I also browse CMON and see what other people do. Sometimes I will copy an idea directly but more often than not I take that idea and adapt it for my model. These blogs are also a very rich source for ideas and of course nothing beats rummaging through bits boxes. Whose Ragnar conversion is that? @Marshal Mr Ron is too modest to let you know that he's the creator:) He's also too much of a class act to point out that if you want an awesome conversion done, he can make that happen. This is one of the biggest reasons I like the plastic kits, they give you more options, it makes the road to more and more advanced conversions. Looking to convert mephiston do you have any suggestions? Just really don't like the look of the model that is currently made. I think Seth and Khan would both make great platforms for Ragnar, but perhaps with a bit more action from the legs. I actually find GS to be a bit of a monkey. Filling gaps and some fur work, cool. The mane around Ragnar's wolf-on-shoulder, not so much. Same with the gem on the chainsword. Gah! RealGenius: I knw they have "characters," but it's not like they have Shrike or Calgar or Lysander. They just have to do with classes of monsters. That's where I figure it will take some painting to make them pop. I suspect you can do some of it with conversion work, but you can only go so far before you start to make it hard for your opponent to figure out what it is that they're dealign with. RuntMcRory: I forgot about CMON and pklaces like B&C, Warseer and DakkaDakka. And those are just the big forums. Marshal Wilhelm: That's mine, I did it for a Client of mine. sometimes I post stuff over there, but I don't spend much time in forums anymore. And thanks for the link. I love the idea of using Khan for a conversion. I'd be tempted to try and build that out of plastic though. Flekkzo: I love plastics too. It gives me the freedom I really want in converting models. Given the choice, I'll take the time to build a model out of plastic before I use a premade metal one... even if they were the exact same pose. Shambler: That's a tough one. He's got that high collar that you'd have to find a way to recreate to get the best effect. Not impossible, it's just going to be tricky. 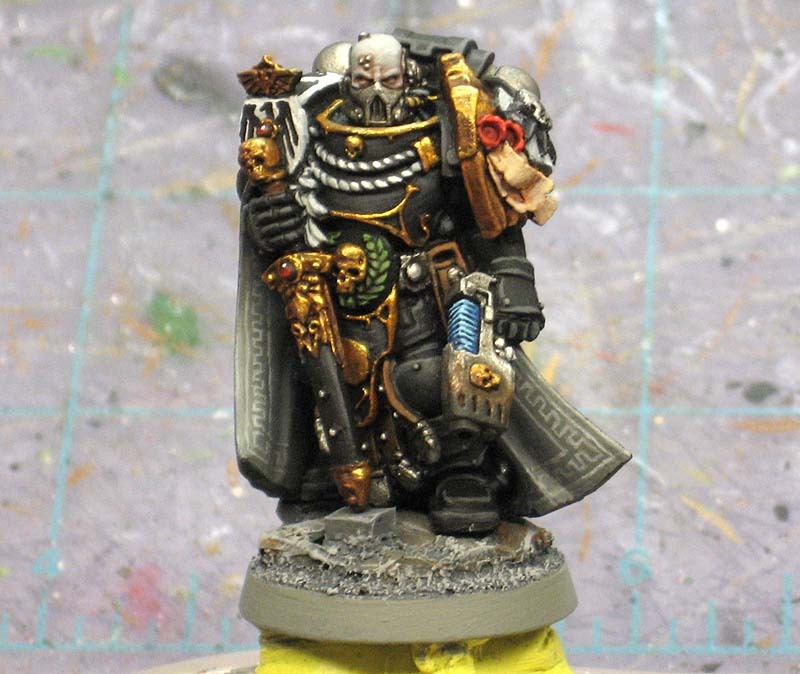 Maybe a Dark Angels robed set of legs, Commander cape, appropriate shoulderpads and some creative greenstuff work for his collar. Marshal: I try and post tidbits over there to share the more relevant things with readers. I don't spend much time in the forums anymore, but I like to get as many opinions on things as I can.